I have disposable nappy guilt after seeing this image, do you too? This image popped up in my Facebook feed yesterday, and shot an arrow straight into my mum guilt heart. Oh gawd, I groaned to myself. Look what I’ve done? You see, I’m guilty of contributing to that mountain of landfill on the left. I’ve used disposable nappies on both of my boys and now that my youngest is being toilet trained, we are getting closer to saying goodbye to them. 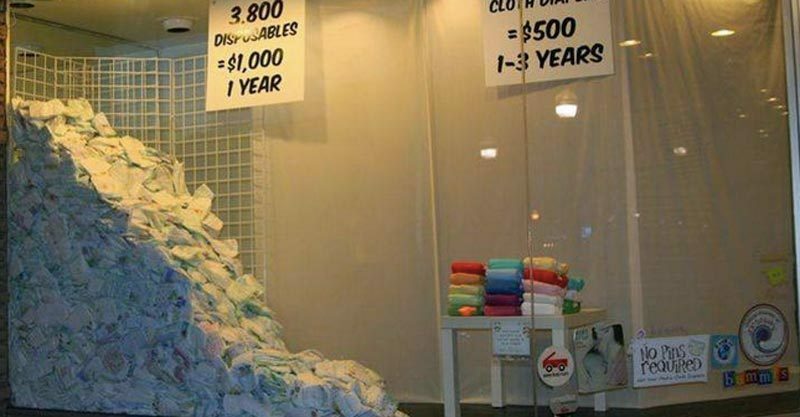 But I can pretty much times that annual pile of nappies by six, seeing as both of my loves have spent about three years each in throw-away nappies. Gulp. Now I wish, I really, really wish, I’d used cloth nappies, maybe not all of the time but at least most of the time with my babies. Are you feeling the same way after seeing this photo? I’ve always known disposables were bad for the environment, but seeing this picture has made me understand just how much of an eco hazard they truly are. 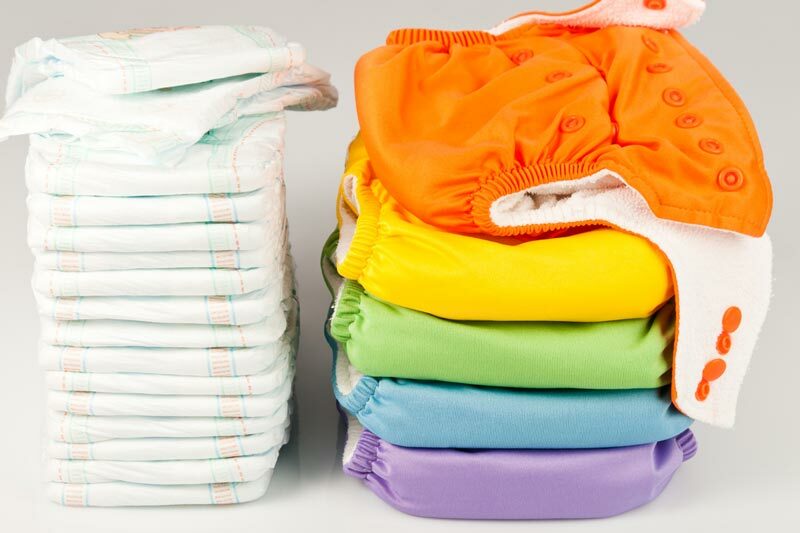 The nappies I have tossed in the bin over and over for five years in a row now are slow to degrade, in fact it is estimated that it takes around 200-500 years for just one nappy to decompose. Just. One. 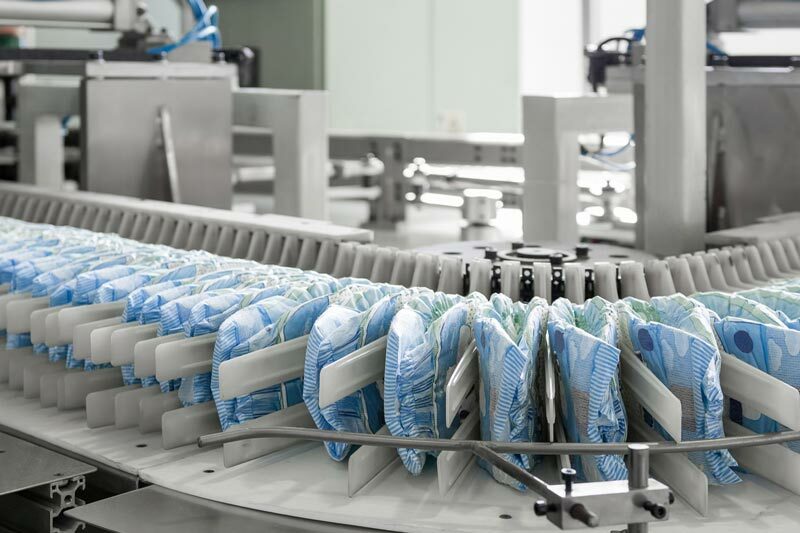 Add the energy used in producing the thousands of nappies I’ve purchased over years, as well as the number of trees to make the pulp that goes into them and the gas emissions that trapped waste cause and I have to admit I’ve made a big environmental sin in choosing to use them. There were so many reasons why I didn’t bother with cloth nappies. In the early days when my babies were little poo machines and I was a sleep deprived mess, it just wasn’t practical, I remember thinking. My washing load back then was also overflowing, without adding cloth nappies to the pile. Plus, every other parent I knew used disposables. I wasn’t alone. Even my mum told me how lucky I was not to have to wash nappies every day like she did. Maybe I wouldn’t have used cloth nappies on my squidgy newborns in the beginning, because I will be honest here, I know I was too fragile to not have had the convenience of disposable nappies to help me cope back then. But when my babies started pooing less often and I wasn’t such a deer in the headlights new mum, I definitely could have made the switch to modern day cloth nappies – those pin-less fitted ones that are not only washable and reusable but also cute as a button. If I had done this, I know I would have still used disposables for nights (lest the cloth ones leaked) and probably also when out and about. But that huge nappy mountain in the picture would have been more of a small mound. How can I make amends now? I feel I need to act now to reduce my family’s carbon footprint going forward. I can’t take back all the nappies I’ve tossed into landfill, but I can do better going forward. The first thing I am going to do is toilet train my youngest, once and for all. He’s reluctant to use the toilet and we’ve been trying for a while, but I need to stick with it to get him over the line and out of nappies. I’m making the switch to undies with him today and while that might mean lots of accidents (and extra washing for me), It’s time I got him there. I am also going to get better with things like walking instead of driving if the distance is short, turning off lights when we are not in the room, composting, and recycling beyond just tossing glass and plastics in one bin and paper in another. Soft plastics (like packets and plastic bags) that can’t go in the plastic bin at home can be tossed in the ‘soft plastic’ recycling shoot at my local supermarket. There’s lots I could be doing and I need to teach my boys to do their bit, too. And lastly I can write a story about how this picture has made me feel. In doing so I hope it inspires other parents who are spending over $1000 a year on disposables nappies to rethink using them. Like I said, there are some really cute modern-day cloth nappies out there!